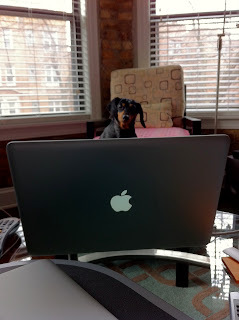 That's my dog, Ruthie, working on her novel. She won't tell me what it's about but she has assured me that it's not about a middle-aged female doggy struggling with growing old in this modern society. I'll give you a preview once she lets me read the first draft. Because I know you're wondering, yes, she does have a special keyboard with Dachshund-sized keys.